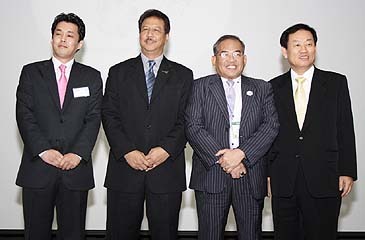 MTPB Director Abdul Mutalib Awang (second from right) poses with Vice President Jon Kim (right) of Korea Tourism Association, Mr. Mohd Rosly Selamat (second from left), chief operating officer of Pempena SDN BHD, and Director Chun Chang-Min of Huelife Co. at "Malaysian Golf Seminar" held in Seoul on March 2, 2007. 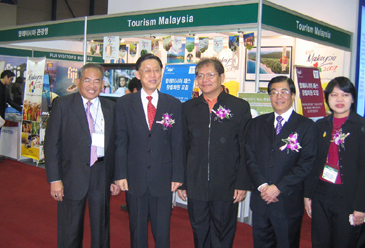 "Malaysian Golf Seminar" introducing golf resorts in Malaysia was held on March 2, 2007 at the Seoul Trade Exhibition & Convention (SETEC) in southern Seoul. The seminar was aimed at promoting golf markets of Malaysia on the occasion of "Visit Malaysia Year 2007." Malaysia's popularity as a choice destination for golfing has grown in recent years and there are more than 200 golf courses across the country which have been designed by top golf architects such as Robert Trent Ones Junior and Ronald Fream. 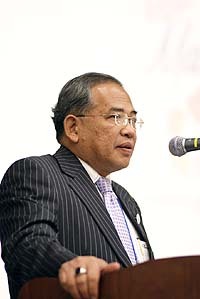 In his opening remarks before 300 plus audience, Director Abdul Mutalib Awang of Malaysia Tourism Promotion Board (MTPB) in Seoul said that Malaysia has a wide variety of attractions to offer ranging from white sandy beaches, tropical jungle of Borneo, shopping facilities to exotic multicultural extravaganza. Director Abdul Mutalib Awang of Malaysia Tourism Promotion Board (MTPB) Korea gives a speech at "Malaysian Golf Seminar" in Seoul. "One of our sports tourism important market segments is of course golf," he said pointing out that success as a leading golf destination is due to the quality of golfing facilities, world-class infrastructure and favorable exchange rate, which allows foreign golfers to stretch their currency even further. He went on to say, "This is made possible due to a wide range of excellent championship and signature golf course located within or in the vicinity of Malaysia's main centers." Malaysia continues to be preferred tourist destination with tourist arrivals in2006 exceeded 17.5 million, according to Mr.Mutalib. Official tourist arrivals from Korea last year were tallied at 189,464, an increase of 19.8 % from one year ago. "The year 2007 continues to be very busy time for the tourism industry, especially with the many programs and activities planed for the VMY2007." he said adding that this celebration in conjunction with the 50th anniversary of the country's independence showcasing some interesting events and packages. During the seminar, a South Korean travel agent dealing with golf membership sales for Malaysia introduced various programs of golf membership in Malaysia. Question and answer session followed the presentations.